PM narendra Modi Flips "B Team" Charge, Alleges Congress, Deve Gowda's JDS "Secret Pact"
PM Modi Flips "B Team" Charge, Alleges Congress, Deve Gowda "Secret Pact"
Rahul Gandhi had accused HD Deve Gowda of being a proxy - "the B-team" - for the BJP and urged voters to spurn the JDS. 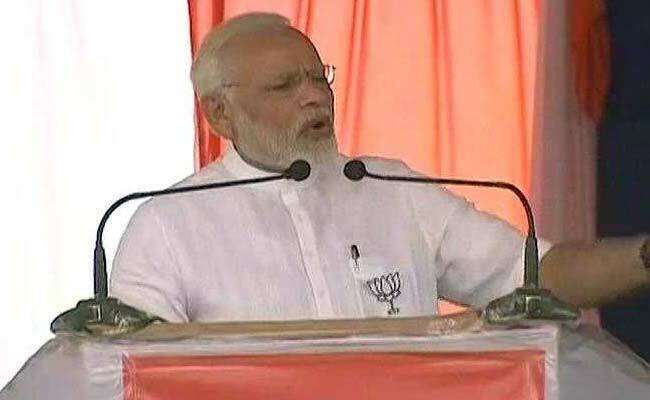 Rebutting the Congress's allegations that former PM Deve Gowda's Janata Dal Secular is the Bharatiya Janata Party's Team B, Prime Minister Narendra Modi today said, "It is the Congress that is secretly working with them and the two will align after the elections." "Poll surveys, political pundits...everyone is saying the JDS cannot defeat Congress. They cannot form government on their own. If anyone can change the government in Karnataka, it is the BJP," PM Modi told the huge crowd in Tumakuru district. Alleging that "the JDS was protecting the Congress", PM Modi said, Congress and JDS have a "secret understanding". In March, Rahul Gandhi accused Mr Gowda of being a proxy - "the B-team" - for the BJP and urged voters to spurn the JDS. PM Modi's attack on JDS and the Congress comes just days after he praised Deve Gowda as a "veteran leader" and rebuked Rahul Gandhi for his offensive remarks on the JDS chief. "Rahul ji you disrespect Deve Gowda even though you are a novice and he is a veteran," PM Modi had said at one of his election rallies. His generous praise for HD Deve Gowda was seen as PM Modi's plan B to have an arrangement with the JDS, which according to many will decide whether the Congress retains the southern state - or loses it to the BJP. Mr Gowda, however, has clarified that he will not allow any alliance with the BJP. In a warning to his son, the JDS chief said that he will "disown" his son HD Kumaraswamy if he decides to align with the BJP. Stressing that his party would form the government on his own, Mr Gowda said "if not given mandate will sit in opposition." The Congress and Mr Gowda too have a heavily scratched record. In 2005, Mr Siddaramaiah, then considered Mr Gowda's protege, exited the JDS after the senior leader moved his son, HD Kumaraswamy, to pole position. Mr Kumaraswamy would go on to bring down Karnataka's first coalition government - the JDS and the Congress - and became Chief Minister. Opinion polls claim that voting on May 12 could conclude with no party getting a simple majority - and Mr Gowda's JDS could be the decision-maker.